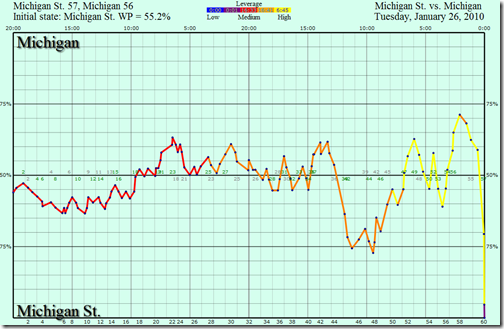 All of the images are linked to Pomeroy’s full screen graphs (much easier to read) and you can get to any game by clicking the score of a particular game on Michigan’s team page. It was fitting that Michigan’s season ended as painfully as this one. 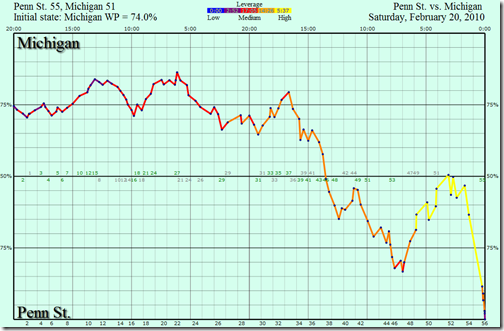 Evan Turner’s running shot that ended Michigan’s season is one of the more interesting graph’s from Michigan’s season. 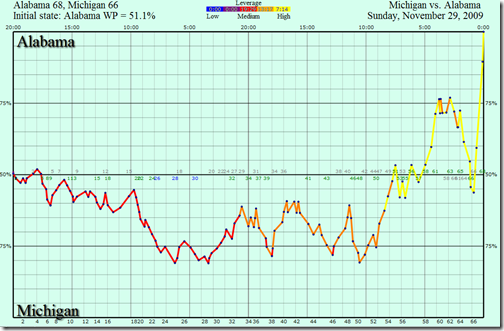 Pomeroy’s numbers had Ohio State in control for most of the game before Michigan’s late run put them above 90% win probability. Then this happened. This is the one game that was really back and forth on the list. Michigan countered every attack by Michigan State and pushed the game back to their side but in the end when it looked like they could finally knock off the Spartans, Kalin Lucas put a dagger in their hearts. These three are almost identical. 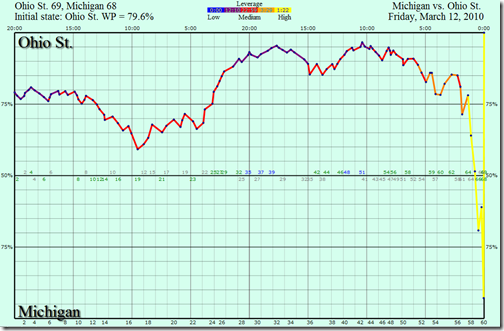 Michigan was in control for significant chunks of the game and then fell apart down the stretch. You could just as easily have thrown the Penn State game on the list and it would follow a similar pattern. 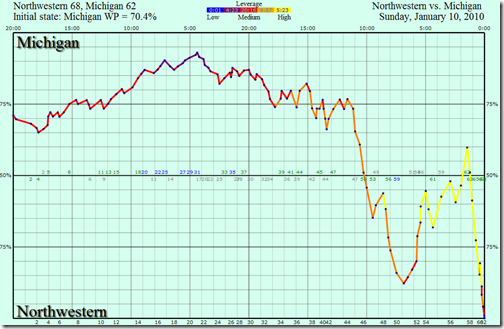 Certain moments on these graphs stick out – for example the end of the Northwestern game where Michigan takes control before Manny Harris gets beat on a backdoor cut. This obviously isn’t the happiest way to start the day, if you want to look at a few more cheery graphs then check out the Connecticut, Ohio State, Minnesota, and Creighton games.